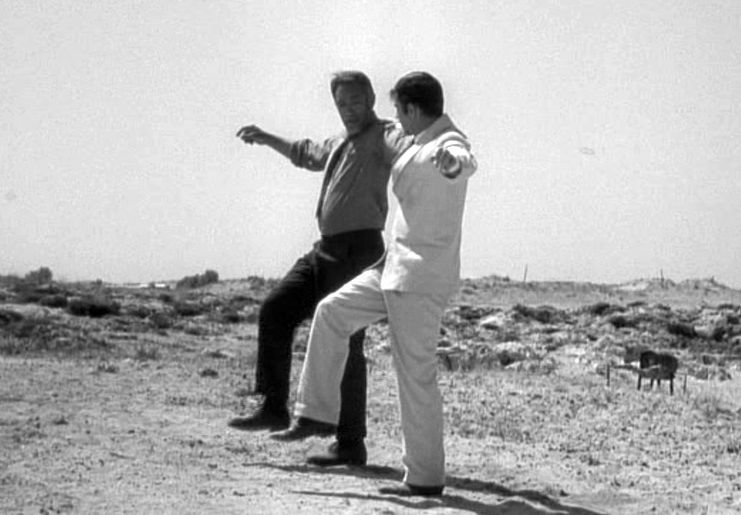 There was something unique about Zorba the Greek (1964) that makes it stand out far above the accolades that it gained: it won three US Academy Awards and was nominated for four others, including Best Picture, Best Director, and Best Actor. It remains today as one of the greatest cinematic expressions of existential engagement and is still a must-see for every young person setting out on his or her own. The story is based on Nikos Kazantzakis’s Greek novel, Life and Adventures of Alexis Zorba (1946), the 1952 English version of which was titled, Zorba the Greek. The screenplay from writer-director-editor Michael Cacoyannis is a bit different from the novel, and I think the changes made improve the telling. Nevertheless, as was the case with Breakfast at Tiffany’s (1961), whose production also had to convert a first-person authorial perspective into the concrete imagery of film and thereby made similarly significant changes, I again recommend both reading the novel and seeing the film. Despite their somewhat differing perspectives, both the texts and the films have valuable things to offer. Basil’s relationship with Zorba and how it affects his outlook on life. In fact it is the last narrative thread that is the most significant. In the novel, emphasis is made on the idea that Basil is going through a spiritual crisis. He turned away from Orthodox Christianity, has been seriously exploring Buddhism, and now finds himself stuck in a mental block. In the film this spiritual crisis goes unmentioned: the author is simply said to be suffering from “writer’s block”. But in both cases It is through his relationship with Zorba that he begins to see another perspective on things. The narrative goes through roughly five stages of development. 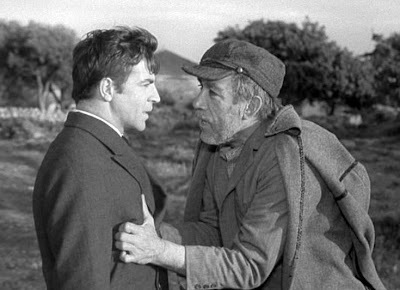 While Basil is waiting for a ship to take him from Greece over to Crete, Zorba approaches him seeking employment. Zorba is rough-hewn peasant, perhaps in his fifties, who says he is a musician and can do all sorts of jobs. Basil is bookish and refined, Zorba is the opposite – extroverted and boastful. They make the crossing in rough seas and find their way to an impoverished Cretan village near Basil’s abandoned lignite mine. There they are joyfully welcomed by all the locals, and they go on to make arrangements to stay in the local “Ritz” hotel run by an eccentric old French lady, Hortense (Lila Kadrova). 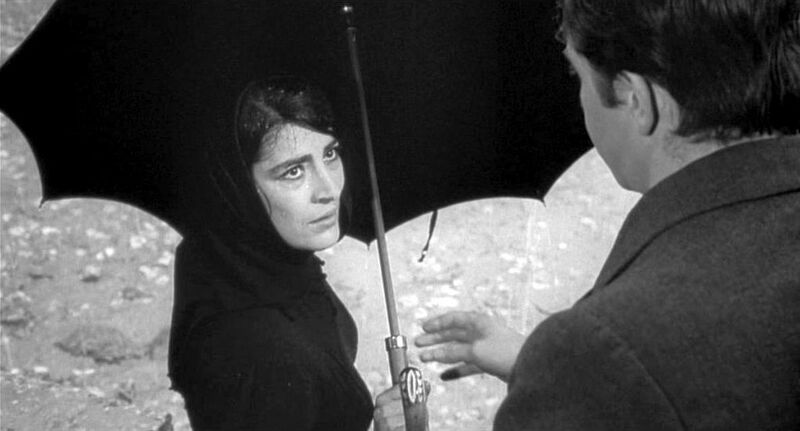 At a local café, Zorba and Basil see that a beautiful and lone Widow (Irene Pappas) spurns the amorous advances of senior village figures’s infatuated son, Pavlo, and that she is also the object of the all local peasants’ lustful and resentful gazes. By the end of this section all four narrative threads are operative, with Zorba evidently pursuing Hortense’s affections and emphatically suggesting that Basil seek similar favors from the Widow. Zorba and Basil get more acquainted with each other as they attend to the lignite mine. In particular, Basil learns about Zorba’s need to express himself through dance and his passionate engagement with the living here-and-now. The mine is very much run down, with decaying wood beams making it regularly subject to cave ins. Zorba then comes up with the idea of getting the rights to the surrounding trees on the hillside that are owned by the local monastery. With wood from the trees, they can refurbish the mine and sell the rest as timber. 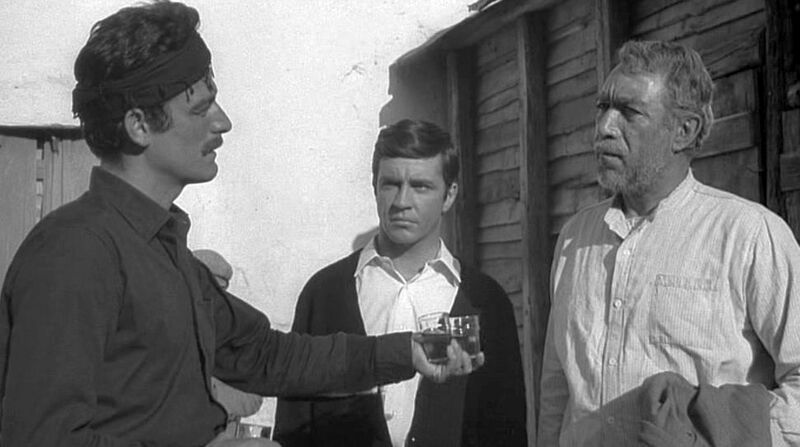 Zorba goes to the monastery to negotiate, and although Kazantzakis’s cynical views of the Orthodox Church are largely cut out of the film script, there is sufficient material here to see that Zorba views the monks as superstitious and corrupt fools who can be seduced with wine. 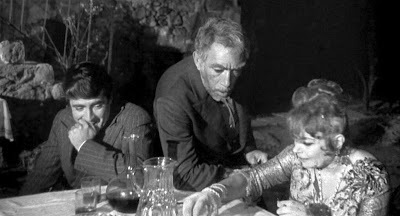 During this section of the story, Zorba continues his affair with Madame Hortense. Meanwhile the reticent Basil is evidently attracted to the Widow but too shy to act. When Zorba urges Basil to act, Basil says he doesn’t want to make trouble. But Zorba responds by saying. “Boss, life is trouble. Only death is not. Basil is worried about lack of progress with the mine and his declining funds, so he sends Zorba on a trip to a nearby commercial town to acquire some provisions for their timber venture, which will involve a trolley wire structure to transport logs down the hillside. When Basil is angered by receiving a message from Zorba boasting of his sexual exploits with a prostitute in the commercial town, he decides to punish Zorba by telling Hortense the lie that Zorba intends to marry her. Meanwhile Basil finally summons up the courage to go to the Widow’s residence and spends a the night in her arms. However, Pavlo learns of their tryst and commits suicide. When the Widow attempts to attend the church Easter ceremony, she is blocked by Pavlo’s father and forced out into the courtyard, where a venomous crowd has gathered to stone her for her “immorality”. Basil is unable to stop them, but Zorba arrives just in time to prevent a local village thug from knifing the Widow. However, when they attempt to leave the scene together, Pavlo’s father runs up and slits the Widow’s throat. The crowd quickly disperses, and Zorba and Basil are left to stare at the slain woman on the ground. Later, Hortense, now more frail and suffering from some consumptive illness, presses Zorba about his supposed marriage promise. Zorba relents and they holds a private ceremony exchanging vows under the stars, with only Basil (and God) as witness. But Hortense’s illness worsens, and spying village crones rush around saying that the foreigner is dying and that since she has no legal heir, they should all grab her belongings before the government confiscates them. With Hortense still alive, the villagers, mostly women, surround her house like scavengers and begin stripping everything. Hortense dies in Zorba’s arms, as the cackling ladies swarm into the hotel and grab everything that is movable. With the romantic quests disastrously terminated, there is still the possibility of realizing Zorba’s ambitious plan of harvesting the timber from the hillside forest. The villagers and the monks gather for a ceremonial inauguration of Zorba’s now constructed trolley wire for timber transport. The local bishops gives his blessing and successive logs are sent hurtling down the hillside transport wire. But Zorba’s system was badly designed, and after only three logs, the entire structure is destroyed, sending everyone scurrying for cover. Although much of the philosophical and religious speculation in the novel has been removed from the film script, the movie does convey the most essential element, perhaps even better and more vividly than Kazantzakis’s prose does -- the unquenchable spirit of Alexis Zorba. Yet the villagers are not simply cast as brutes. Through Walter Lassally’s expressive cinematography and the melodic instrumental folk music of Mikis Theodorakis, the village life is presented as rich and full of the joys and woes of life. For the most part, Zorba and Basil are part of and take part in their world. Now, he says, he takes people for what they are, not what they represent or what uniform they wear. In contrast to Buddhism’s ego-denying nihilism, Zorba always immerses himself passionately in the living moment, which is exemplified by music and dancing. Those two modes of being represent the two choices for Basil, and in the end he chooses Zorba’s path. 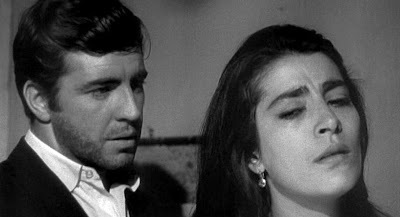 To adjust to the UK-Greek co-production and the performance of Englishman Alan Bates, the ethnicity of the writer is altered somewhat. 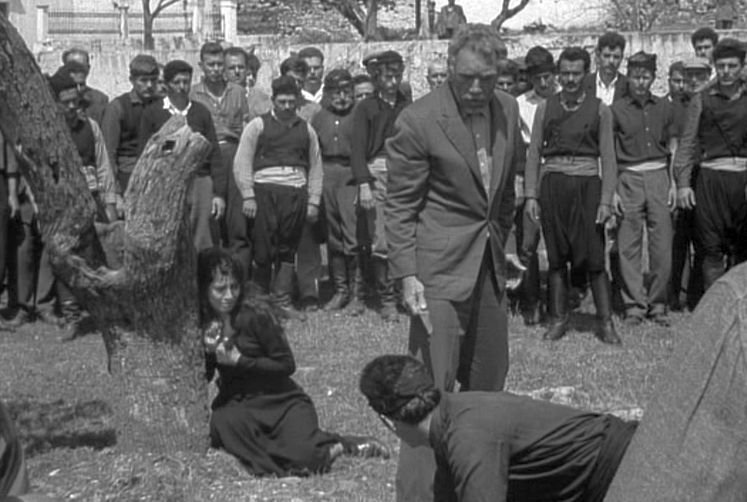 While Kazantzakis’s unnamed narrator was Greek, the film’s protagonist is said to be half-English and half-Greek. This actually has a positive result, because it makes Basil even more of an outsider to the Cretan local community. In the novel, the narrator was Greek, not half-English, so Hortense was the only real “foreigner”. I've been meaning to see this movie, so I can't comment on the film version yet. 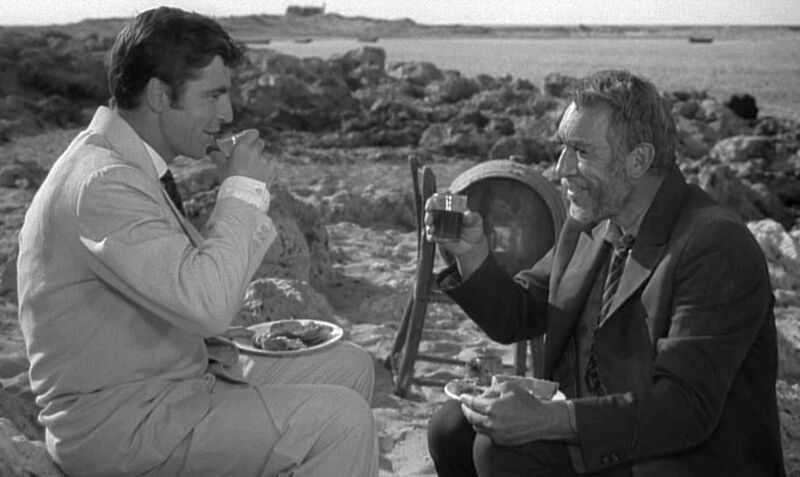 But in the book I never got the sense that narrator actually came around to Zorba's way of viewing the world. He acknowledges the superiority of viewing the world the way Zorba does, but his actions (and seemingly his continued commitment to an academic lifestyle after he leaves Crete) leaves me to suspect that the transformation never completes occurs. If this is the case, then the movie deviates in an important way from the book. I'm curious to see if my reaction to the film turns on this difference. Also, good spot on labelling this an existentialst work. Kazantzakis isn't usually branded as an existentialist, but I've always considered a precursor of the movement. Thanks for the comment. Yes, the ending is somewhat different, but I think the narrator in the novel is inspired and changed by Zorba's way, even if he doesn't choose a path identical to Zorba's.